To address this, researchers at the Fraunhofer Institute for Technological Trend Analysis INT and the Fraunhofer Institute for Photonic Microsystems IPMS have created a new kind of alarm system that detects any attempt to manipulate the window. This new system registers changes in temperature in real time and the vibrations caused by external interference with the glass, thereby leaving burglars no choice. The window panes of art galleries, jewelry stores and banks are protected by alarm and fitted with security glass; but the pane or part concerned has to break before the alarm is triggered. Standard security glass contains metal threads that tear during mechanical damage, thereby activating the alarm. Traditional systems react either too late or not at all if a cutting torch or a drill is used to damage the glass. Instead of a hammer, burglars use a drill or a blowtorch to exploit this shortcoming. Fraunhofer researchers have jointly developed a smart anti-burglary protection system that resolves this issue. The new system dynamically and quickly records thermal and mechanical stresses from external causes. Just a manipulation through the use of a flame or a gentle knock against the security glass is sufficient to trigger the alarm. The external force exerted to the pane changes its mechanical characteristics, and these changes are detected by the system. This method of monitoring glass panes is based on a glass break sensor built inside an optical fiber with the help of fiber Bragg grating, i..e, optical interference filters inscribed in optical waveguides. The fiber optics can be integrated in the corner of the windowpane or in other positions. An optical sensor is a sensor with the fiber Bragg grating, reflecting a specific wavelength of light that is changed by variations in elongation and/or temperature. If somebody exercises pressure on the glass pane or heats it, the distance between the grating elements changes, which in turn alters the transmitted wavelength. Sensitive optical measuring devices are capable of recording these changes. If the changes are greater than a predefined threshold, signals are transmitted to the alarm system. The pioneering break-in protection consists of a fiber optic supply cable, a Bragg grating, an interface to the alarm system, as well as evaluation electronics, which contain the optical measuring device. In the near future, the evaluation unit, to which numerous fiber optics can be connected, is to be integrated in the window frames. The evaluation unit can be located far away from the security glass in high-security zones. Measurement with fiber optic sensors is a good solution for these requirements, because it uses light instead of electricity and widely available fiber optics instead of copper wires. The smart alarm system was scrupulously tested in numerous attack scenarios on a broad range of different security glass panes involving hammers, drills, baseball bats, axes, firearms and heat guns to pinpoint when the alarm is accurately triggered. The effectiveness of the sensor with fiber Bragg grating has been exhibited in various tests, including the VdS test by VdS Schadenverhütung GmbH in Cologne. The VdS seal of approval, which is a prominent distinction in German industry, is issued by the independent, notified, and accredited testing and certification institute for fire protection and burglary prevention. 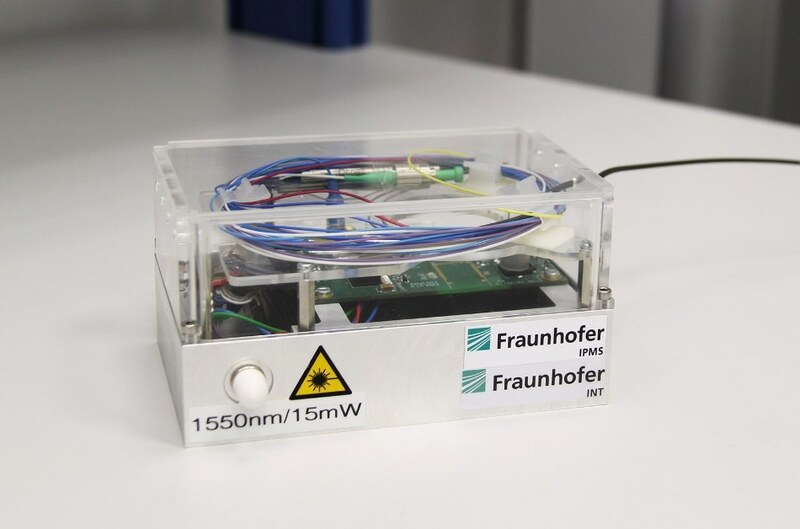 Currently, the burglary protection system developed by Fraunhofer researchers exists as a demonstrator. The evaluation electronics is a small box and measures only 14 x 9 x 7 cm³. This can be further miniaturized, if need be. The system is capable of not only protecting jewelry stores and other objects bound to be burgled, but is also suitable for monitoring bridges, pipes, wind turbines, buildings, load-bearing structures in the aerospace industry, and much more.